Russian-led forces have mounted nine attacks on Ukrainian troops in Donbas in the last 24 hours, the press centre of the Joint Forces Operation (JFO) has reported. "In the combat area of the operational-tactical grouping "North," the enemy fired at the positions of our troops from large-caliber machine guns near the village of Khutir Vilny in the Luhansk sector," the JFO staff said on Facebook on Saturday morning. In addition, Russian occupation forces opened aimed fire from grenade launchers, heavy machine guns and small arms attacking the defenders of Hnutove, Krasnohorivka, Vodiane and Pisky. "There were no Ukrainian army casualties in the past day due to criminal shelling of the Russian occupation forces," the JFO staff said. 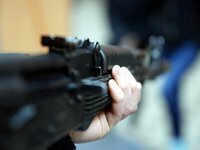 According to Ukrainian intelligence, one militant was killed on January 18.